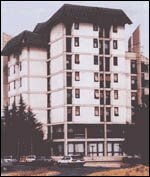 Address: "Maršal Tito Square b.b." Location: In the center of Kavadarci, near the municipality building, on the main city square. Information: It is build in 1968. Total capacity of the hotel is 25 rooms comprising 25 double and 1 apartment room. Features: a restaurant, banquet hall (with capacity of 350 guests), cocktail bar. All rooms are equipped with TV sets and phones. The Hotel has balcony witch viewpoint is opposite city square. Location: Feni is located on the periphery of the city, 2 km away of city center. Information: The Hotel is build in 1979/80. Total capacity of hotel is 25 rooms double and 4 apartment rooms. Rooms are nice arranged, with phone and TV sets. The banquet hall in the Hotel is with capacity of 450 guests. Within the social premises, at guests disposal is a small conference room, TV room and premises for daily residence. There is also small banquet hall arranged in traditional environment.